I spied a comment recently lamenting the difficulty the writer had getting friends and family to read a manuscript, in part or whole. The comment was posted to a writers’ group and the discussion that followed, as happens, seemed a good topic for a post in this space. First, I understand the writer’s desire for feedback and frustration at the lack thereof. Speaking as a writer myself, I’ve experienced this and, conversely, I’ve experienced writer-editors who’ve been more than generous with their time. One, my friend Gisele, also my editor on the job at the time, returned my manuscripts red inked with edit notes (something she did whether I asked for editorial feedback or not); another, Christine, a writer I’d met at a workshop, gave me some critique notes (after informing me that she only had time to read part of the manuscript) and a suggestion that I apply for the international fellowship to participate in the Breadloaf Writers Workshop. Both were extremely helpful. I made the edits, and I applied and was accepted to Breadloaf with an international fellowship; and I have three books to show for those relationships. While working on draft eleventybillion of the third one of these books, I would read excerpts to my friend Alstyne (RIP) and though she was not herself a writer, her feedback purely as a reader – what she reacted to enthusiastically or less than enthusiastically, the questions she asked, the commentary she gave – was helpful to me not only in shaping that book but in keeping me going. The thing she gave me that was invaluable was her genuine curiousity about how the story would turn out and her belief not only in the story I was struggling to tell but in me as a writer. Yeah, I miss her. That’s just a sampling of the times I reached out for and received feedback, and these are the books that came to be as a result – once you add on the editors that actually worked with me on prepping the books for publication. There were many other times when I reached out to people and did not receive feedback. Or the time I received only partial feedback from a certain teenage reader in a very tight window but it was enough to help me figure out if the content, tone, and language of a certain teen/young adult novel would connect with a teenage reader. Sometimes, as with the children’s books, I got creative about seeking feedback by sneaking them, blind, in to reading material being critiqued (kids, teen workshop) or testing them on children I would be reading to anyway (children’s reading club, schools). The times when feedback was sought and the answer was either no or no follow through, I may have been disappointed at the time but I wasn’t mad. Honestly. Okay, maybe a little mad but I understood. See, some of this overlapped with me getting requests to read this, write that from other people and sometimes saying yes even though I knew I didn’t have the time either because I genuinely wanted to, wanted to give back some of what had been given to me, or couldn’t figure out how to say no. So when I say I understood, I understood. The requests to pick my brain or read work became more plentiful after I became a published author i.e. a writer in the public domain. And the thing is each person thinks that they’re not asking much, but it adds up, you know, it takes time. That’s one of the reasons I added editing and critiquing to my freelance services after a time – (initially with some guilt but) I was doing it anyway and with my time covered, and a commitment made to a client, there was a guarantee that I could get it done and in a timely manner. The person who inspired this post also griped about the circle not leaving reviews that could help with promotion once a book had been published. I’ve experienced this as well. And it’s frustrating. But I remember, too, the times I’ve been asked to review books. It’s time consuming and a positive review is not guaranteed (at least not from me, nor do I expect them from others if they believe the work doesn’t merit it). I got one of my most scathing reviews from a Caribbean blogger I reached out to and bent over backwards to get the book to, and I have others here and there who took the book and never bothered to post anything. The former is one of the realities of being published, the latter I can’t do anything about except choose more carefully next time. Meanwhile I do try to pay it forward by posting reviews – hence my Blogger on Book series, which I have to admit is more fun than writing reviews for a paying publication (though not financially smart, right?) because I feel freer to review or not review (I never want reading to feel like a chore). That said, I will take those paying review gigs because baby’s gotta eat. The responses to the original poster was pretty much as I expected though – people are busy, there’s no expectation that they’ll have the time, or interest, if they do, say thank you; if they don’t, accept it without malice. And if they still don’t follow through after saying yes, roll with that too and don’t keep them in your mind; sometimes people are well-intentioned but time is short (been there, both sides). I have benefited from all of these and I offer at least three (see my services here). As for friends and fam, and writers you know, try to understand, before you ask that it’s a big ask. If they can do it, sure, but, if not, it’s important to remember that everybody’s busy living their life. Frustrating as it can be. Friends and fam are not always the best critics in any case – though they can be good for encouragement. Take what you can get and find other avenues. This picks up where the previous Antigua and Barbuda Literary Works Reviewed pages left off (there was one, two, three, four, five , six – use the search feature to the right to dig them up if the links don’t work). As with those earlier pages, it features reviews about A & B writings that I come across as I dig through my archives or surf the web. You’re welcome to send any credible/professional reviews that you come across as well. They’re not in any particular order, I just add them as I add them; some will be old, some will be new. It’s all shared in an effort to underscore Antigua and Barbuda’s presence in the Caribbean literary canon. “…what’s most intriguing is Dot Kid’s magnificently imaginative editorial photographs that capture the surreal and otherworldly in beautifully compelling ways.” – AfroPunk on the art of Antigua-Barbuda’s Dot Kid. “In her debut collection of poetry, Marilyn Sargeant, a contemplative and introspective writer, as well as light-hearted and playful in her verses, presents her readers with both narrative and lyrical poetry that is innocent and explorative, as well as dark and brooding—touching upon topics which have stood the test of time in their truth and importance for contemporary audiences.” – Anna Grace, B.A.H. Eng. Lit., M.Ed. “Children will likely relate well to this story of getting lost while daydreaming and to the reassurance that kindly adults will look after strays. The book also gives them a chance to learn more about the work of environmentalists and Caribbean sea life. “O’Marde’s first book after a well-established reputation as a playwright, the fictional book Send out you Hand, was weighted and slow by comparison – exposition heavy, the characters too often coming across as mouthpieces for the writer’s intellectual concerns rather than fully drawn people. Dr. Paget Henry, pictured here at a past conference at the Enlightenment Academy is one of the chief organizers of this annual August event. He is the author of several books including Caliban’s Reason. Pictured are two of the conference’s presenters: left, Brenda Lee Browne, and, right, Dr. Natasha Lightfoot. This was taken at the launch of Dr. Lightfoot’s book Troubling Freedom. Not to be re-used without permission and credit. A review of Colin Jno Finn’s Power Struggle written a few years ago, not sure I ever posted it; so now I am. Colin Jno Finn’s plays take institutions like the church (Power Struggle), the work place (Nine to Five), and the home/family (It’s Too Late) and unmasks them to reveal what he presumably believes to be their true nature – a nature inconsistent with all they pretend (or are designed) to be. Power Struggle, set in the back rooms of church life, is his latest. In it, we have the story of a popular preacher and the efforts of one vocal church board member to, initially, remove him from his perch, and, when that plan seems doomed to fail, manipulate him to her purpose. Power Struggle begins with a surrealistic sequence involving dancers that move like ghosts and someone in the throes of a nightmare. How this prologue connects to the central action is never quite clear to me, but it’s certainly an attention grabbing beginning. The main action begins where most of the action is set, in the place where the church board meets. Right away, it becomes clear that while the church may be about God’s business, the council room stinks of bitchiness – “this woman is always late and always ready to go home early” – and passive aggressive (sometimes outwardly aggressive) antagonistic behavior. The chief antagonist, Sister De Castro enters singing, her self-righteous tone only part of the arsenal in her vocal armory. Sister De Castro, villain of the piece though she is, delivers one of the more effective performances; the actress inhabiting the role with gleeful venom. And the ebb and flow of the meeting has a realistic rhythm to it. In fact, my only beef with this scene – which establishes well who the players are, what they want, and where their loyalties lie – is the shrill delivery of the actress, revealed to be the church treasurer, who most directly challenges Sister De Castro and the fact that that exchange goes on a bit longer than necessary. It’s ironic though when this same actress later in the play accuses Sister De Castro of “overdramatizing” everything, since it feels like that’s what she does with her loud but not deep performance throughout. We meet the preacher shortly and he’s a pretty boy, easy enough to see why the women in the congregation are so in his thrall, and why his secretary, also secretary on the board, is practically in heat in his presence. She tips him to the danger he – or at least his job – is in; shifting, as she does so, from flirty to gossipy to aggressive to aggressively sexual in tone and delivery. The preacher is seemingly clueless and dismissive at first then, flip the switch, and he’s a petulant kid in the throes of a temper tantrum. To put it another way, his foot stamping, hand slicing reaction to the news could have been better. The board chairman’s vote against the preacher in the earlier scene was a bit of a surprise, but it’s no surprise by now that interwoven lives, mixed up loyalties and hidden agendas are the meat of this play. A fact reinforced in the following scene which dwells, a bit more than necessary in my view, on the secretary’s relationship with Sister De Castro, and her divided loyalties as a result. The plot thickens. Except that that particular plot thread is just kind of left hanging. Let me touch on plotting and pacing for a bit. There are plot points that don’t quite add up, for me, as the play advances, but the early scenes do a good job of establishing the world of the play – establishing character, creating intrigue and tension, moving the story forward. And I think on paper the play is nicely paced. In execution, the pacing – and mood shifts – are somewhat hurt by the lack of efficiency and precision with respect to the back of stage activity; costume changes, lighting, sound, props. Props though to the set design, a simple split down the middle, separating office and meeting room, that should have allowed the action to move more seamlessly than it did. Another production note, there’re musical asides in the play for entertainment and mood enhancing value. The church re-enactment scene complete with dancers, singing, and over the top preaching work; the scene with the secretary belting out Whitney Houston’s I Look To You would have worked better in my view with an original song more specific to the context. Or should have been cut altogether. The extended attention given to the secretary in that scene, and the shifting points of view in the play in general make it difficult sometimes to know with whom to ally. The collective dislike of Sister De Castro makes her the obvious villain, though everything is, frankly, always a bit livelier with her around; and among the shrill, jellyfish-ish, fork tongued lot, one would be hard pressed to find a hero, or even a likeable character. The writer does attempt character insight when he breaks the forth wall for one of the play’s more interesting sequences – a series of monologues as the warring board members and preacher, in tableau, serve as backdrop. This means a second (unconvincing) dose of the secretary’s inner life that might have been substituted for a bit of insight on the Preacher; I mean, even the member with his pants pulled up like Tyler Perry’s Mr. Brown who spends meetings reading the paper gets his moment. Knowing more about where the Preacher’s head was at might have helped me sympathize a bit more with his predicament. The Preacher does come alive during that song-and-dance church session referenced earlier. It was entertaining, the preacher shucking and jiving, and letting his Jamaican accent out – “I’m ready and I’m hable” – and hitting us with the hyberbole – “a vote for me will secure a spot in heaven” – to comic effect. I like that the humor feels like a natural extension of the action and not an unnecessary diversion for the easy laugh. The good reverend says something that echo my sentiments during the last scene where Sister De Castro, having won him the re-election, moves in for the kill: “I guess I’m just trying to process everything around here”. I found myself at the end still trying to untangle some of this thought provoking and unrestrained testimony of church life. Overall I thought it was entertaining; I thought the writer was focused in his story telling and paced the story well but could have paid a bit more attention to characterization – though I’m not sure if this is a problem of scripting, directing or quality of actors. Plotting, as I mentioned, was strong in parts, weaker in others; but the unblinking assessment of church life earns the writer/director points for, well, going there. That’s my honest assessment, though I would add that I’m thrilled at this writer/director’s continued growth, openness to constructive feedback, and commitment to the development of his craft; it bodes well for the future of theatre in Antigua and Barbuda. This is a challenge within a challenge. You don’t know about the original Cushion Club Wadadli Pen Summer Reading challenge? Here it is in 50 words or less: Read as many books as you want, write a really-really-really short review of each book read, email your list of books completed and reviews to cushionclub@yahoo.com at the end of August 2015. Maybe win a prize. There are discounts and minimum requirements; search “reading challenge” at the Wadadli Pen website (https://wadadlipen.wordpress.com) go here for details. The Map Shop and the Best of Books helped compile the reading lists, so you know the books can be sourced locally. The Best of Books and Cindy’s Bookstore are offering 20 percent discounts to anyone “taking the challenge”. 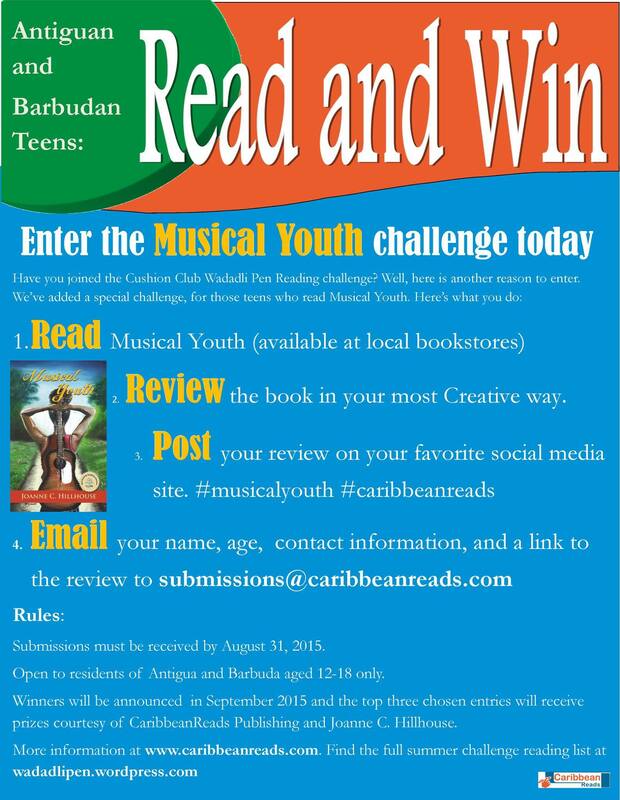 Now, Caribbean Reads Publishing and Joanne C. Hillhouse – publisher and author, respectively – have made the challenge just a little more “Musical”. 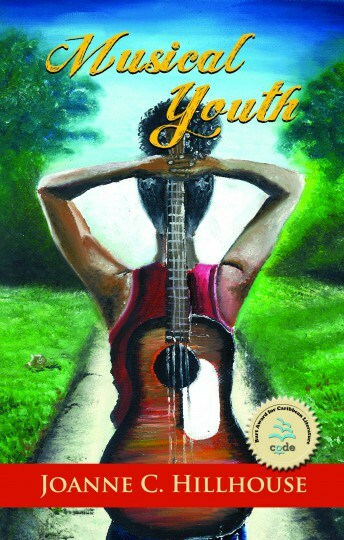 As Musical Youth, second placed for the Burt Award for Caribbean Literature in 2014, is targeted at teens; they want to know what teens think of this book. This additional prize – sponsored by the publisher and author of Musical Youth – will go to the most creative review. Keep it honest: you’re not going to be graded up for gushing over the book if that’s not how you feel. Keep it creative: the internet and social media provide infinite ways for you to express yourself. So, in keeping with the book’s theme and cast of characters who embrace music and creativity, share your review in a way that shines a light on your creativity. Once you’ve posted to your YouTube, Instagram, vine, tumblr, twitter, or wherever, email the link and your contact information to submissions@caribbeanreads.com. Feel free to tag as many people as you want in the meantime. You can tag Hillhouse and CaribbeanReads via any of their social media platforms – but you still need to email the link to submissions@caribbeanreads.com. Check caribbeanreads.com and https://wadadlipen.wordpress.com for more details (oh, you’re already here). You must be based in Antigua and Barbuda to participate. And remember this is part of the Cushion Club Wadadli Pen Reading Challenge. So, you know what you have to do first: read…and remember, get creative and have fun with it. Sharon Millar’s Whale House and Other Stories – Good Book. Go Read. On my facebook page, I post #whatimreading quotes from books that I’m reading. Usually a sentence that jumps out at me – makes me laugh, cry, think, or just pause because, wow. I amassed quite a few while reading Sharon Millar’s The Whale House and Other Stories – more than any other book I can remember reading since I started doing this. Thirteen by my count; would have been more if I hadn’t restrained myself. Didn’t get to post them all either before I finished reading, which is a miracle considering how slowly I read these days when there is so little time to read and so much distraction when I do. It’s not a miracle, actually, it’s a testimony to how this writer weaves words. So carefully threaded, so intricately woven; the stitching is beautiful but then you pull back to see the full effect and the impact is powerful. 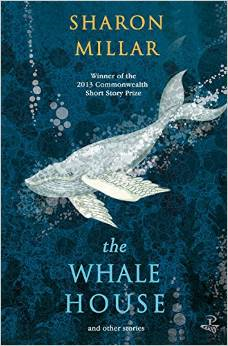 I came across one review of her title story The Whale House, a Commonwealth short story prize winner, which described it as overwritten; and I couldn’t disagree more. Her words aren’t just for show – look at me, look at me, I can write! – they add texture, so that even where the plot seems languorous, it’s not flimsy; it’s rich and deep and vivid in that there’s always a moment behind the moment – all together, it packs an emotional whallup. This woman is a Writer, capital W. Her book also covers fresh terrain, the kind of terrain you can picture an explorer wading through in heavy boots with a cutlass in hand, because no one’s been there before and s/he has to clear the path. Except, if that analogy is to hold up, she’d have to be an Other and she’s so clearly a part of the environment of which she writes so intimately familiar with its rugged unevenness. It is the terrain that feels new. She is a Trinidad writer who eschews Port of Spain and the more familiar geographic, ethnic, and emotional landscapes of the land and the literature of the land for something a bit more on the fringe, something not as easily categorized. And she does it masterfully – I almost want to coin something like Mistressly there because she is most decidedly a woman writing women, primarily, and digging into the hurt, grazing her fingers familiarly over the spots where the hurt has scabbed over. What I’m going to do is share some of the quotes I pulled and try to explain why I pulled them, including the ones I ran out of time to share on my page, and maybe in that I’ll have communicated something of why I love this book so much – me lub um bad bad bad. “Baking cakes is not the way you throw a baby away.” There is something both matter of fact and domestic about this (dark) moment, in the way of Caribbean women doing what they have to do to hold their families up, hold themselves together, get on with life. “Over the years she’s learned to watch for scorpion fish and the low-lying stingrays that rise like illusions when dusk slides into the bay.” So much poetry here, so much foreshadowing as well, a reminder that she doesn’t use words just to dress up her prose but with purpose…but the way she uses words do dress up her prose. Also, touching on the topography, I feel like I haven’t seen this Trinidad. “I reflect that Rhonda and I have been meeting once or twice a week in the snake house but I’d never asked where she sleeps when she does not come home with me.” One of the few stories driven by the masculine point of view and in this moment a profound statement on the erasure of the female beyond her role in the life of the men passive-aggressively warring over her body if not her, fully. “I still can’t believe a little boy wearing an old Machel shirt shoot me.” I like the absurdist humor of this moment. Written from the perspective of a dying badjohn; also this is how you use a pop culture reference to orient the story and character, not just to give a shoutout. “The child never asks for her father but she still cries at night for her mother.” This story was interesting. We never meet the man who is condemned to death after killing his wife nor the wife but we get to know them through the dying man’s sister’s letters to different people as the bloody, tragic chapter unfolds; we feel her disdain for the abused woman for being naïve, the lingering love for the brother in spite of his failings, the resentment just below the surface at the responsibility that now settles on her shoulders, the problem that is the child left behind. And in this brief sentence we get a sense of the dynamics within the doomed household. I should add that this is a book of mysteries as much of things unsaid as of things said (and in that there’s a sense I have that I’ll have to read it again later to see some of the things that I missed because I wasn’t using my third eye on first read). This spare yet fulsome moment feels a good place to point that out. “The idea of his death frightens her deeply and because of this, she thinks she must still love him.” Love and passion in this work rarely seem to bring joy or peace, this is not the dewy eyed love of romance novels but a grown woman’s realistic, sometimes longsuffering, sometimes cynical acceptance of love in which this sentence of love as a negative, love by process of elimination, the wha na kill fatten variety of love, is emblematic. “Irresponsible people having children had spawned a generation of feral teenagers.” This is as editorial as it gets in a book that can be quite brutal without being judgmental, the anger at the futility of the criminal culture in modern Trinidad (and, typical of this book, a criminal culture that does not locate all the blame nor the action in the capital) bleeding through, but yet ironic, coming as it does from the point of view of a medical examiner who is quite complicit, a criminal with a medical degree which might insulate him from the consequences of his actions but not from the reader’s side eye. “It was Mara who saw the dragonfly, a big blue darner among the red ones who gathered every evening to dance above the olive water of the pond.” Nature is prominent in this novel, and the writer zooms in on the details of nature’s beauty like a skilled photographer with a telephoto lens; the sharper, image certainly in this moment, also serves to heighten the symbolism. “Wool had never mentioned coming upon us in the snake house but every meeting since had been punctuated by little ellipses of old-man hostility and jealousy.” Again with the dry humor. This is the same story with the man and the woman and the snakes, and this references the love rival in as disparaging a way as can be done by a young man…he’s old. “It is good to be reminded that not all animals are dependent on our care for survival.” There is a sense, at points in this book, of the environment being not only living and breathing but purposeful, its purpose not always in concert with humankind’s. I wouldn’t say nature feels malevolent in such times but there’s an awareness that for all our machinations as ‘higher evolved beings’, only so much is in our control, and that you have to understand the land (what will poison, what won’t) in order to survive it. All of this is to say that the book is also quite thought provoking on themes of wo/man’s hubris, insiderness and outsiderness, class, nature just in and of itself, and other things I’m likely missing at the moment. “From my verandah I like to imagine that I am lying on the flat surface of the sea and the undulating land below me buckles up from the ocean floor.” This was the moment when it hit me how far I was from urban Trinidad. “The cave breathes silently in the darkness, the birds shrieking above us.” This is the cave that took the two divers. Nature takes, nature warns, and the author foreshadows. “And she wanted to run and skip and play…and…and I didn’t have the heart to tell her…but, Tiffany, you dead.” Another eerie moment in a story that has something in you tensing as it builds and builds, you suspect, toward nothing good…this is not a book of happy endings. It was interesting to see it bookended in a way by two stories of babies claimed and raised by another. I’m not sure it was intentional but given the careful ordering of the stories in the book, I suspect it was. Full disclosure: I met Sharon (and bought my copy of The Whale House and Other Stories) in St. Croix at the Virgin Islands Lit fest. I bought it not because we were on a couple of panels together and had a joint reading, though we did, but because I’ve been a fan of her short stories for a while. Oh and we’re social media friends. This picture is from one of our panels. That’s Sharon to the left and me to the right; and that’s Tiphanie Yanique, who wrote an enthusiastic endorsement included in the book, in the middle.